We take a look at the Gariz XS-FS2 wrist strap, designed to keep your waterproof camera afloat. The Gariz XS-FS2 Floating Wrist Strap was designed for keeping your waterproof camera afloat while photographing in the water. 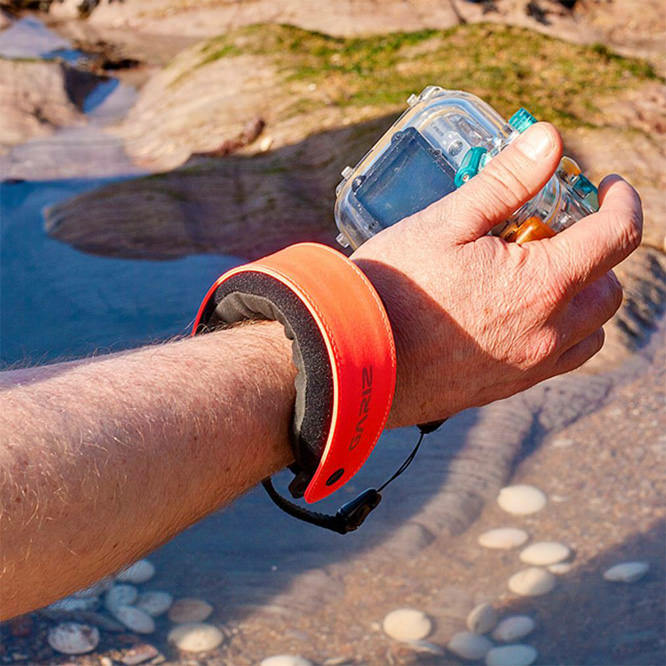 The Gariz XS-FS2 Floating Wrist Strap is designed for comfortable photography in the water. 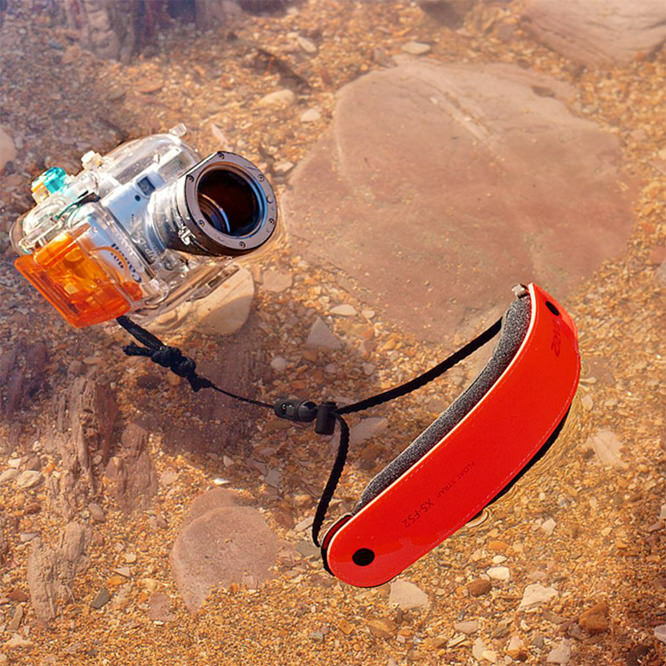 Its excellent buoyancy means that it floats onto the surface of the water so that you can easily discover the camera in case of losing it - due to the high visibility neon orange of the outer band of the strap. 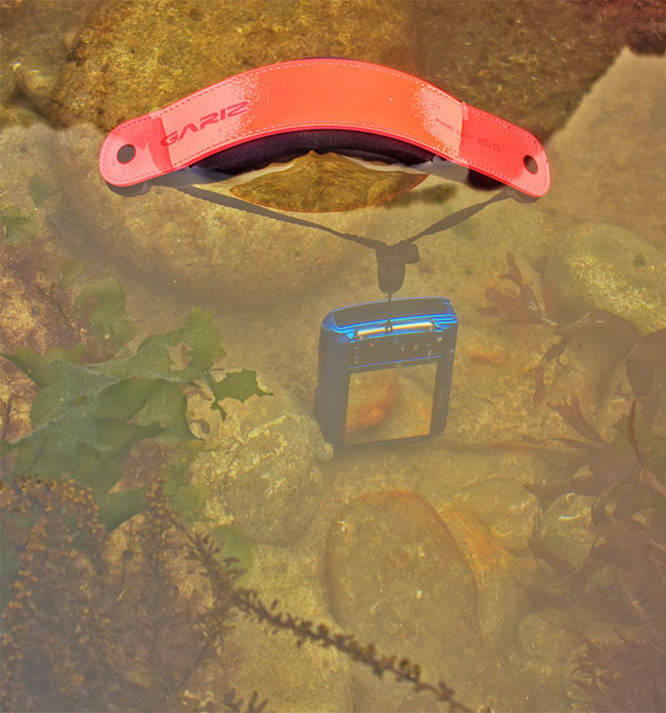 It's ideal for using with waterproof compact cameras or compact cameras with a dive housing. 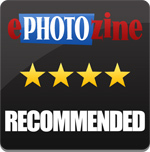 For the purposes of this review, the strap was tested with two different waterproof cameras. The first was a Canon PowerShot A570 IS + Canon Waterproof WP-DC12, this has some natural buoyancy, so whilst the flotation properties of the strap are not necessarily warranted, the strap in this instance offers the bonus of its high visibility. Even smallish breaking waves close to the shore, can have the potential power to make any strap slide off due to the drag of the camera itself through turbulence in the water, so having a floating & brightly coloured band would make it much easier to find the camera if it comes lose. *In big surf/ turbulent whitewater, I may consider attaching a small accessory karabiner between the loops formed between the quick-release clip, as I am not sure what force would be needed to prize the clip open. The second camera the strap was tested with, the Olympus Tough TG-310, has no inherent buoyancy, as is the situation with most waterproof compacts, so here the buoyancy offered by the Gariz strap is an immense advantage, on top of the benefits of the high visibility band mentioned above. This camera weighs 155g and if dropped in the water (without any floatation support) will quickly disappear to the river/ sea bed, the Gariz strap thankfully offers reassuring buoyancy to this camera. The Gariz XS-FS2 wrist strap is available for £24.99 from Love Cases. Alternatives available include the Maxsimafoto orange floating wrist strap, available from Amazon for £5.99, however the design is not as ergonomic. Overall, the Gariz XS-FS2 floating wrist strap is an ideal safety precaution if you do a lot of shooting with your camera in or near water. It is highly visible, making it really easy to see where the camera is should you accidentally drop it. The spongy inner layer makes it comfy to wear, and the only worry is, as mentioned above, it may be liable to slip off your wrist quite easily if you're of a slim build. The Gariz XS-FS2 is a handy accessory that gives peace of mind when shooting photos in water.